Dr. Scott Gaydos began observing with Dr. Potter when he was 13 years old. He began working at Vernon Veterinary Clinic as a veterinary assistant at the age of 17. After high school, Dr. Gaydos attended N.C. State University where he received a bachelors of science in animal science. He then attended Ross University School of Veterinary Medicine in St. Kitts in the West Indies. 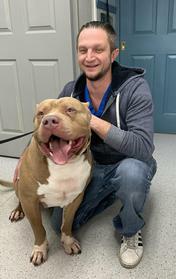 After completeing his clinical training at Auburn University he practiced in New York as a mixed animal veterinarian for 2 years before returning "home" to Vernon Veterinary Clinic. Dr. Gaydos' interests in veterinary medicine are small and large animal surgery and equine medicine. Known for his "heart-on-his-sleeve" approach to caring for his patients you will often find him playing on the floor with his patients. In his free time, he enjoys watching/playing hockey and playing poker. When he's not working you can find him at The Blue Sky Ranch Parachute Club in Gardiner, New York jumping out of perfectly good planes. Dr. Alequin started as a laboratory animal care technician/ farm hand while attending Rutgers University's Cook College where she received a bachelors of science majoring in Animal Science with preveterinary focus and minor in equine science. She has worked as a bilingual veterinary technician for over 8 years while attending school. She then attended and received her doctorate of veterinary medicine from Saint George's University School of Veterinary Medicine in Grenada, West Indies. After she completed her clinical training at Cornell University, she practiced for almost 3 years at a small animal clinic in Hudson County, NJ. Looking to go back to a more rural setting, she recently moved to Sussex County and joined the staff at Vernon Veterinary Clinic. 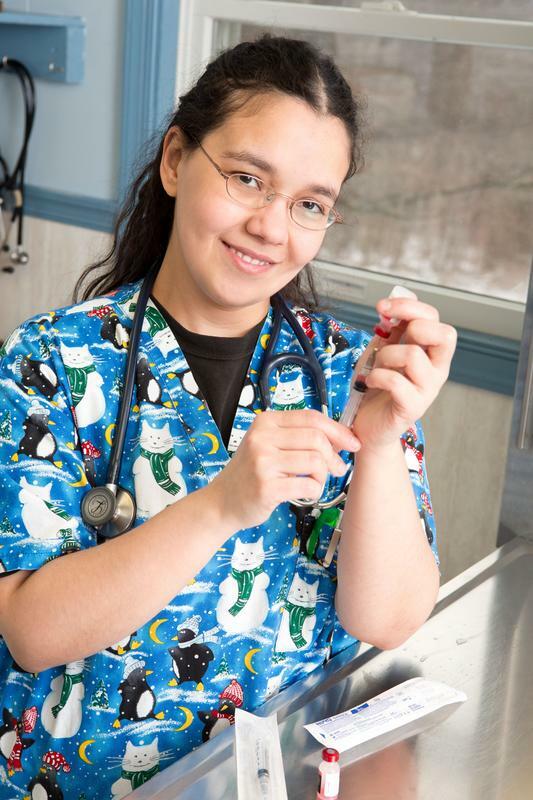 Her veterinary interests include small animal surgery, large animal medicine, exotics/wildlife, shelter medicine, and laboratory animal medicine. On her spare time, she enjoys drawing, sculpting, hiking, raising chickens, and spending time with her dog and 3 cats. Dr. Stephanie Chlebowski was first introduced to veterinary medicine while working as a veterinary assistant at her local animal hospital throughout high school and college. She attended Delaware Valley College, where she worked as a farm hand on the campus's livestock farm until she received her Bachelors of Science in small animal science with a minor in livestock science. She then attended The University of Missouri College of Veterinary Medicine, where she received her doctorate of veterinary medicine. Dr. Chlebowski is excited to begin her career with the wonderful team at Vernon Veterinary Clinic. Her interests in veterinary medicine include small animal dentistry, animal behavior, neurology, internal medicine and exotic animal medicine. In her free time, she enjoys hiking, photography, watching her favorite hockey team, bowling and sheep herding with her Collie Fleetwood. Dr. Chlebowski also has a cat named Jovi and a hedgehog named Axon.